TONI&GUY Baker Street opened in August 2015. 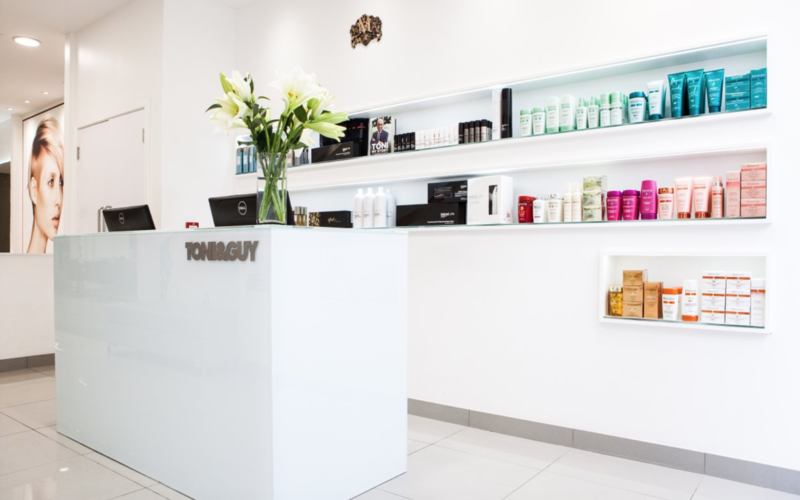 It's comprises of a strong team of talented and passionate stylists and technicians who will ensure your TONI&GUY experience is a fabulous one for both you and your hair. Our stylists and technicians are on hand to give you expert advice and create hair that is individual and easy to live with, interpreting fashion trends with versatile wearable styles.Members of Baker Street are part of the TONI&GUY Session Team and have worked alongside the International Artistic Team on catwalk shows at London Fashion Week, bringing the latest trends from the catwalk to our clients. We offer many additional services including Bridal and Occasion hair NanoKeratin Smoothing blow-dry. Our wide range of haircare products include label.m, Kerastase, GHD and Tangle Teezer to keep your hair salon perfect until your next visit. We have a fully operating Beauty team, Chic Beauty offer a full range of services. Samuel was great. This was the first time he cut my hair and he did a fantastic job. He listened to what I had in mind and the gave his expert opinion and I am so happy with the result. I will be coming back. I can just say that I’ve always had execelent results when it comes to Bradley. I’ve known him for more than 3 years and the reson I started coming to Baker street it’s that he recently moved there from the previous place I used to go to a while ago. He’s amazing, and has a very unique style. His attention to details is extraordinary. But ,overall, all staff was very friendly and professional. Give it a go! Hi Louise, we really appreciate your lovely review and are pleased to hear you enjoyed your experience in our salon. We hope to see you again soon! After making me feel ridiculous for asking for a fringe, the hairdresser completely ignored what I asked for, which was lots of layers and still left my hair quite big at the bottom. He had already decided what my hair should look like, no matter what I said. Instead of enjoying the feeling of walking out of the shop with a spring in my step, I tied my hair back as soon as I left the salon. I will not be returning to this salon. The other staff were lovely and welcoming and I can't fault them. Nikos was amazing he gave me good hair tips and ensured he followed what I wanted but still did what was best for my hair. He showed me everything he used for my hair as he went along. Overall great service and friendly. Couldn’t fault him! I had various collaborations with Nikos in the past, he is always professional and he does amazing work! He always listens to me and gives me the best advice for my hair. He made me feel comfortable with him from the first moment and he was very friendly. I am a regular costumer and I trust him a lot, his expertise, creativity and talent has win my trust and respect for him! Hi Joanna, its great to hear how happy you are with your experience here at Toni & Guy Baker Street :). We will be sure to pass your lovely review on to Nikos who will be so pleased to hear such nice words from you! We look forward to seeing you again soon. I had various collaborations with Nikos in the past, he is always professional and he does amazing work! He always listens to me and gives me the best advice for my hair. He made me feel comfortable with him from the first moment and he was very friendly. I am a regular costumer and his expertise, creativity and talent for me has win my trust and respect for him! Thank you for the amazing haircut, and also for your advices!!!! I am very happy with the results, and the bowdry was perfect!!! Ane, thank you for the lovely review. We are so happy to hear that you enjoyed your service with us at Toni&Guy Baker Street. Thank you for the review Steph. I ended up with a much shorter hairstyle and a fringe dispite having shown a picture where the length was kept and with no fringe in. I was the 2nd person that day to be unhappy and feel like they hadn’t been listened to. I honestly looked like an 80s scarecrow and I don’t know how anyone could have expected me to leave the salon looking like that. Thanks to Samuel for doing the best he could but I currently have my hair in lots of hairgrips as I hate the weight of hair on my face and had gone in specifically to rectify from a previous hair cut choice and explained that. There is nothing to do but grow it out. Hi Clare, thank you for your review. We agree, Flo is very talented and will be pleased with your feedback. We look forward to seeing you in the salon again soon. I wanted I scissors cut but got a clippers cut. That was disappointing. There’s always some issues on the sides for me with clippers which I can notice after this cut. For the price I had assumed it would be a scissor cut. Thank you for your feedback Juan. We are very sorry to hear that you were unhappy with your cut. We would be more than happy to rectify this. Please give us a call on 0203 824 2567 to discuss this further. It was my first time seeing Samuel and he did a fantastic job on my curly hair. He listened carefully to what I was after and did a great job. He was also really pleasant and warm and the whole experience was great. The other salon staff were very friendly and helpful too. Lovely atmosphere. Will definitely return. Thanks! Thank you for such a nice review Paula. We are all very happy to hear this, especially Samuel.